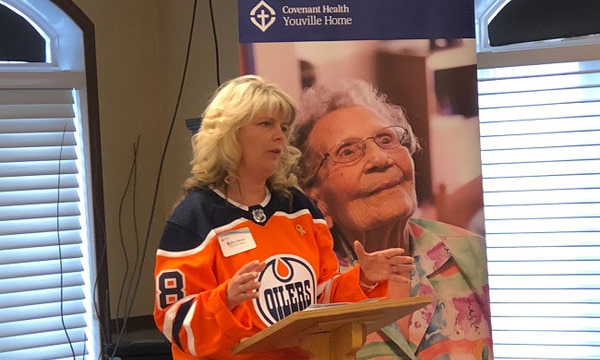 Mayor Cathy Heron (pictured), executives and others gathered at Youville Home for an exclusive project preview on April 12, 2018, and to hear about the $1 million we're raising to fund it! 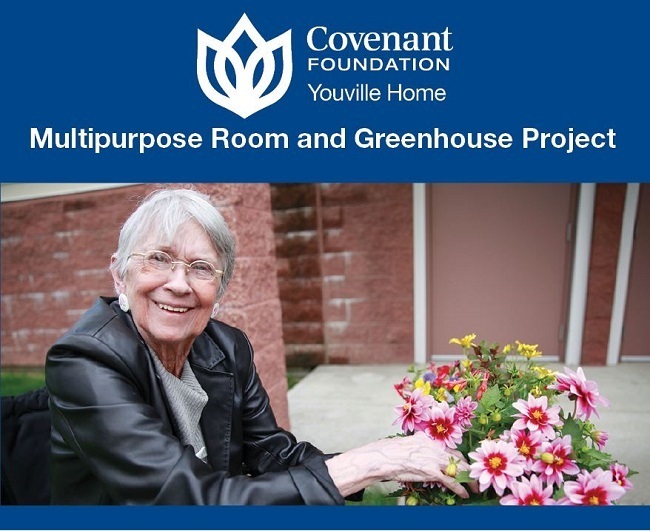 Covenant Foundation is pleased to support improvements at Covenant Health’s Youville Home in St. Albert to include a multipurpose and four-season greenhouse space. With the support of community members like you, we’re raising $1 million to fund the expansion. Your contributions will mean residents have additional space for reflection, group activities, visiting space, and access to gardening and additional recreation therapy year-round! We’re looking for individual donors, businesses and service groups willing to contribute to ensuring residents have space to live to their fullest capacity, active and connected at Youville Home. We invite you to be a part of enhancing care in your community. Youville Home is exactly that—a home, where the sounds of laughter and living fill the hallways. Residents and their families spend time together, visiting, playing games and enjoying activities that provide meaning and quality of life. With the addition of the Sigis Daycare program, we have infused activities at Youville Home with the vibrancy of children, as they engage with residents, reading and singing, bringing a renewed sense of energy and excitement. As the community of St. Albert continues to evolve and change over time, so does the community of people living at Youville Home. Our residents range from 24 to 104 years of age, and their needs are broad and varied. That’s why we need your help. With the planned expansion, residents will have access to a range of therapies, year round. The new flexible space will expand current programming and improve access to better enjoy the outdoors. Multigenerational activities such as a gardening club and baking programs will provide both residents and daycare children experiences that will give a renewed sense of purpose, wellbeing and increased happiness. We need your leadership and commitment to community. Join us in expanding Youville Home for its 233 residents of all ages and backgrounds by adding your support to this $1 million campaign. Recognition opportunities exist. Contact us today to discuss the possibilities unique to your gift. Like any long-serving infrastructure, times have changed and the building needs to change with it. An increased number of residents with wheelchairs and walkers means fewer people fit in spaces designed years ago when fewer residents required mobility aids. Programming and therapies have evolved to feature music, art and gardening–activities that require more and/or specialized spaces. Adequate space in rooms allows for visitors, but doesn’t accommodate larger families. Using the fireplace at the entrance as a lounge area presents risks for exit-seeking in residents suffering dementia and other ailments, not to mention the constant drafts from opening doors. With your help, and with recent understanding of residents’ needs for a healthy and happy life, Youville Home is positioned to continue its history of service in the community. it encourages the use of motor skills, reduces stress levels, and improves well-being and social interaction. As an added benefit, it also increases the availability of fresh produce for residents. The 1000 sq. ft. expansion, situated just off the auditorium, will have large doors to accommodate wheelchairs and walkers. The space will allow for larger entertainment performances, resident gatherings, and activity programming, including year-round gardening. When not being used for larger gatherings the multipurpose space is designed to invite relaxation and reflection. It will be a warm and welcoming space for residents to receive visitors and socialize. Contact us today to discuss the possibilities unique to your gift. Covenant Foundation partners with the community to support Covenant Health, Covenant Care and Covenant Living sites across Alberta. We invest in transforming health care and helping to create vibrant communities of health and healing.